“Heidar Ghiai.” Encyclopaedia Iranica, ed. Ehsan Yarshater, Vol. X, Fac. 6. Columbia University, 2002. “André Godard.” Encyclopaedia Iranica, Columbia University, 2002. “Gabriel Guevrekian.” Encyclopaedia Iranica, Columbia University, 2002. Eero Saarinen died on September 1, 1961. He had just turned 51. Saarinen was a shooting star whose light shed brightly upon American architecture with buildings that were at the cutting edge of technology to become instant icons of modernism. He also influenced product designs for living introducing such iconic modern furniture as the tulip chair and the womb chair. He was catapulted into the architectural limelight early in his career by winning together with his famous father, Finnish architect Eliel Saarinen and brother in law Robert Swanson a widely publicized national competition for a museum on the Mall in the nation’s capital. Everyone soon knew the design was the brainchild of the young 29 year-old Eero. While never built, the Smithsonian Gallery of Art nevertheless, succeeded in changing how museums were designed in America and the world. Twenty years later Saarinen designed an airport that changed the way airports were built in America and the world. Both were in Washington DC. Both were significant projects to Saarinen. The Smithsonian Gallery of Art established him as the rising beacon of modernism in a country not quite ready to embrace the movement. Dulles Airport was in his own words his best building. But Washington was also briefly Saarinen’s home. During the early 1940s when he served in the OSS–Office of Strategic Services and the precursor to the CIA–Saarinen lived in Georgetown and had an office in the city. At age 90, Frank Lloyd Wright publicly presented his drawings for a consummate urban center in Baghdad, Iraq. 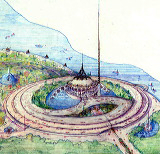 The plan for an island in the Tigris, a “Greater Baghdad Cultural Center” called Edena after the garden of Eden, included a commissioned opera house he translated into a civic auditorium, a planetarium, a landscaped park with pools, foun­tains and waterfalls, buildings for ancient sculpture and contemporary art, a bazaar, a botanical garden and zoological park, a monument to the eighth century caliph, Harun al-Rashid, a processional boulevard and butterfly bridge lined with merchant kiosks, a casino, amphitheatre, heliport, radio and television towers, and a circular university campus across the river, all related in a constellation of spirals and ziggurats.[Fig. 1: Aerial view 5733.008] Other drawings showed a commissioned post and telegraph building for downtown Baghdad. Wright was invited to design an opera house by Iraq’s Development Board, then pursuing the second phase of a successful infrastructural and architectural improvement program funded by oil revenues the new nation had negotiated with Great Britain. In 1957, the board commissioned four other Baghdad projects to architects from the West: Walter Gropius, Baghdad University; Le Corbusier, sports complex; Gio Ponti, Development Board headquarters building; Alvar Aalto, a museum. The story of Wright in the context of this unique Baghdad architectural venture is the subject of a book manuscript I am now finalizing. Discussions of the Baghdad projects include Mina Marefat, “Wright’s Baghdad” in Anthony Alofsin, ed. Frank Lloyd Wright, Europe and Beyond (UC Press: Berkeley, 1999), pp.184–263; Mina Marefat, “Bauhaus in Baghdad: Walter Gropius’ Master Project for Baghdad University,” Docomomo (Docomomo International, Issue 35, September 2006) pp.78–86; Mina Marefat, “1950s Baghdad Modern and International,” TAARII Newsletter (The American Academic Research Institute in Iraq, Issue 2-2, Fall 2007) p.1–7; Mina Marefat, “Architecture Baghdad: Les Dessins de Frank Lloyd Wright,” Beaux Arts Magazine (No. 233, October 2003) pp. 68–73; Bruce Brooks Pfeiffer, “Frank Lloyd Wright and Baghdad,” Frank Lloyd Wright Quarterly, (The Frank Lloyd Wright Foundation, Vol. 15, No. 1, Winter 2004) pp.4–17; Neil Levine, The Architecture of Frank Lloyd Wright (Princeton University Press: Princeton, 1996), pp.383–404; Joseph Siry, “Wright’s Baghdad Opera House and Gamage Auditorium: In Search of Regional Modernity,” Art Bulletin, (CAA, Vol. 87, No. 2, June 2005) pp.265–311. The exhibition, attended by some 600 guests at the Iraqi consulate in New York City, marked the twenty-third birthday of Iraq’s King Faisal. Olgivanna Wright described reporters and photographers surrounding her celebrity husband. Olgivanna L. Wright, Our House (New York: Horizon Press, 1959), p. 214 Many of the drawings also appeared in a Wright coordinated article, “Frank Lloyd Wright Designs for Baghdad,” Architectural Forum (Vol. 108, No. 5, May 1958) pp.89–101. Barely two weeks later, Time featured the Baghdad project in glowing terms under the title “New Lights for Aladdin” (19 May 1958) p.80. The New York Times also reported on the exhibition (Saturday May 3, 1958). Wright produced detailed working drawings for this building, commissioned to him during his 1957 Baghdad visit. The announcement of the project was made in the during Wright’s Baghdad visit, when he was photographed with the Minister of Development; “Mr. Lloyd Wright in Baghdad,” Iraq Times, May 29, 1957, p.3.